John Singer Sargent was born in Florence, Italy, on January 12, 1856. His parents were Americans from Philadelphia: Fitzwilliam, a physician, and Mary Newbold Singer Sargent. After the death of their first child, Fitzwilliam and Mary went abroad for a period of recovery that lasted the rest of their lives. The Sargent children were born and raised in Europe, among a shifting community of fellow expatriates. The surviving children (John, the oldest, along with his sisters Emily and Violet) were basically home schooled, and John grew up learning the languages of the many countries the family would call home. Both of his parents were artistically gifted, so painting and drawing expeditions were a natural part of his youth. Johns own artistic talents soon became apparent, and his parents secured for him what additional education they could, eventually moving to Paris when John was 16 to enroll him in the atelier of the painter Carolus Duran. As both an American and Durans youngest pupil, Sargent created a stir with his precocious ability, and soon became his teachers favorite student. In a few years, Sargent's first paintings were accepted for exhibition at the prestigious annual Salon in Paris. 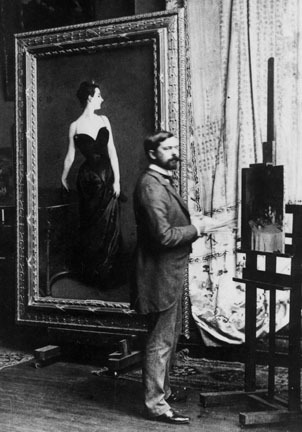 His future success seemed assured, at least until the scandal in the Salon of 1884 surrounding his Portrait of Madame X, which played its part in moving him away from Paris. Sargent eventually became the best known portrait painter of his time, finding success and recognition both in England, where he eventually settled, and in America, to which he made regular working visits of some duration throughout his adult life. Around 1905 Sargent shocked his public by announcing his retirement from portrait painting, choosing to focus his vast energies on his landscape painting and growing commissions for mural and decorative work. Many of his upper-class would-be sitters refused to take no for an answer. Therefore, in spite of his reluctance, some measure of portrait work remained a factor in his life. Awards were piled upon Sargent in his lifetime, as well as numerous honorary degrees. He was a member of the major art academies of the time, a teacher and a champion of other artists and composers he considered of merit. He was also an accomplished musician and, although known for his awkwardness in public, entertained his close friends and family with boisterous musical performances of his favorite operas, accompanying himself on the piano. Sargent loved food, cigars, opera, theater and the symphony, and he loved to paint. He never married, and left no diary. He worked until the day he died. On April 15, 1925, after spending the day helping to crate the latest installment in his Boston Public Library mural series, Sargent died in his sleep at the age of 69. A changing art world inevitably left Sargent behind, but in time his obvious gifts came again to be recognized, and his brilliant portraits of an age now gone treasured once more. The setting for the play is the artists studio in London on the evening of January 8, 1916.